For centuries, people have been shaping hedges into crisp lines and geometric patterns to create breathtaking designs. 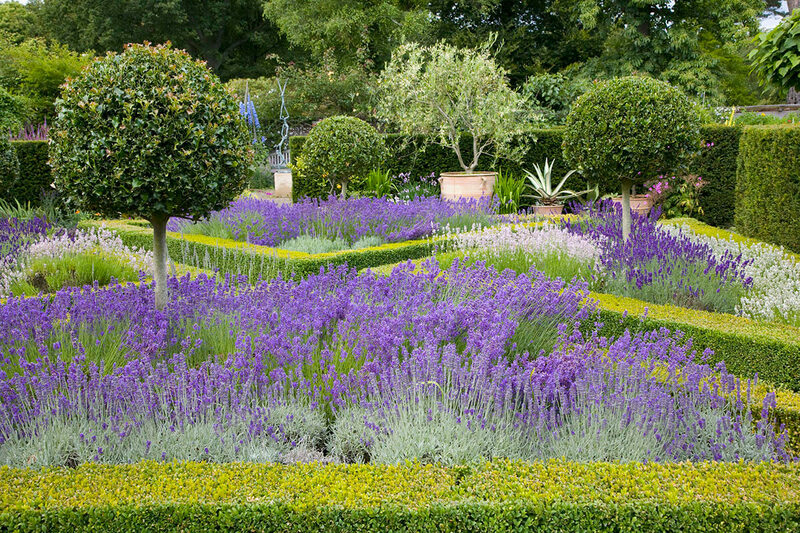 Formal gardens may take on a very traditional, renaissance-type design, or they may be very modern. Modern and formal gardens often implement the same design principles of clean, geometric lines, so they blend well together. Since the elements of a formal garden are very simple, it is a style that can be adapted to any location. Country homes, suburban residences, urban rooftops, event venues, institutions like government or university buildings, public parks, botanical gardens, resorts, and more can all use formal gardens to their advantage. Formal garden techniques can also be applied to other spaces like entries and driveways, using the clean lines of hedges with accent plants shaped into columns or other topiaries. Formal gardens are usually a defined space, separate from the rest of a landscape, so they can be implemented in any type of garden without changing the feel of the overall design. In winter, golden brown leaves remain on the European beech (Fagus sylvatica) hedge brightening up this winter landscape. With sophisitcated hedges, even a garage/storage building like shown here can be made less noticeable in a commercial landscape application. Older European beech (Fagus sylvatica) hedges can be pruned to create shapes or even structures like this arch. An entryway or courtyard in a modern landscape can give an air of elegance with the use of well-manicured hedges. Interplanting purple and green beech trees to form a multi-colored hedge creates a delightful backdrop. Create a calm, private garden area by surrounding with a solid Arborvitae hedge. A driveway framed by trees can be made even more distinguished with a hedge border behind. European beech (Fagus sylvatica) makes a stately background for displaying art in the garden.